Continuing its gradual metamorphosis into the Funny Or Die Channel, Comedy Central will air an all-new half-hour Between Two Ferns special on May 6, resurrecting Zach Galifianakis' interview show right before The Comedy Awards as a sort of intentionally awkward version of Barbara Walters' pre-awards show conversations. Scott Aukerman—who's directed many previous Ferns segments as well as this special—made the announcement on his Comedy Bang Bang podcast, saying that Galifianakis' guests would include Tina Fey, Jon Stewart, and Richard Branson (though, as Pop Culture Brain suggests, it's possible that "Richard Branson" could also be someone appearing in character, which could also be said of the real Richard Branson). 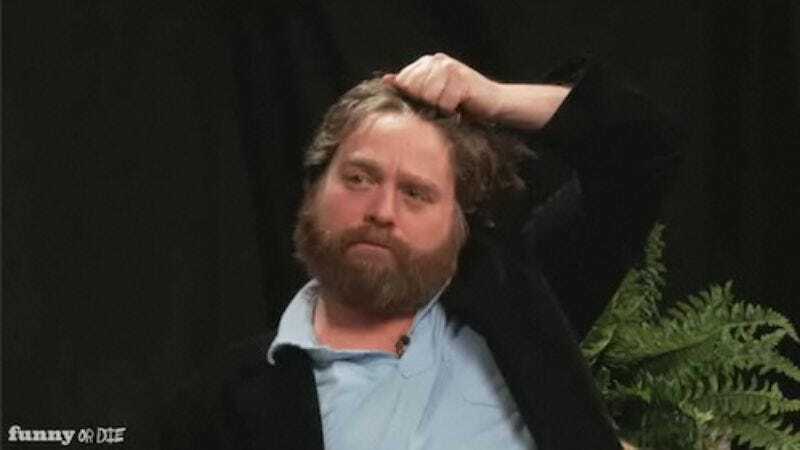 The show, subtitled A Fairy Tale Of New York, not only marks Ferns' first foray into television but also its first new episode in nearly a year, and it's likely the only Ferns you're going to get for a while so long as people keep paying Galifianakis Hangover money.